Vork uses the simplest, most-intuitive interface utilizing the natural PHP syntax. This empowers developers to reach maximum build pace without wasting time figuring out how to get things built. Vork is the easiest framework to use and, as such, significantly increases developer-productivity throughout the project lifecycle. Automation of many development-procedures eliminates redundant and trivial tasks from the project-timeline. This also increases the speed of change-rollout, leading to quicker, more-agile iterations that exponentially accelerate the time-to-market. Increase datacenter traffic-capacity simply by using Vork. Vork can operate entirely from RAM without any disk-activity - this yields performance and scalability in a different league from any disk-based application and approaches the speed of a cached-response. Vork's standardized MVC-compliant project structure puts objects exactly where developers will innately expect them, fostering an effortless natural-transition when developers need to get acquainted with different projects. Vork uses best-practice mechanisms of separating business logic, data-management and display/user-interface to facilitate parallel development from typically-dependent IT roles. This effectively reduces dependency-chains and shortens the critical path, thus optimizing your company's resource utilization by leaving projects with increased timeline-buffer and the potential to deliver ahead of schedule. 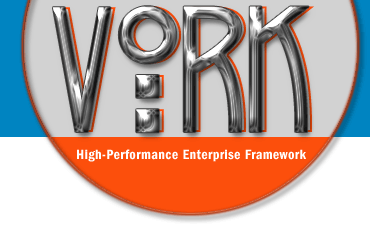 Vork is the ONLY fully standards-compliant enterprise PHP framework. Vork projects are accessible to all users regardless of ability or browsing platform. Choosing Vork means reaching 100% of the intended audience; no Internet-user will be prevented from utilizing an application built with Vork. These benchmarks were completed using standard cloud-servers and cloud-based load-tests so that anyone can easily repeat these benchmarks and validate the results. The cloud-servers tested are the smallest size on Rackspace Cloud that have 256mb of RAM, cost $0.015/hour ($11/month) and are pre-installed with Ubuntu Linux version 11.04. The load tests are generated with PerformancExpert PX-Lite using the "Extreme Stress" test and setting Delay Between Page Requests (click frequency) to 1-second so that each user makes a page request once per each second. To serve as a baseline-comparison of each framework's core scaling-capabilities, these benchmarks test for simple "Hello World" as this represents the upper-maximum of a framework's traffic serving abilities. Zend Framework served 250-users for 1-minute until requests began throwing timed-out errors. By the second minute of this load the response time had slowed to 4.6 seconds. By minute-3 the web server became unresponsive (request time exceeded 28-seconds) and the benchmark was stopped; the web server did not recover and needed to be manually restarted in order to continue serving page requests. Symfony could not sustain more than 40-users on these budget 256-mb servers. With the addition of another 15-20 users response-time had increased to more than 5-seconds and after just a few seconds of this load the entire cloud-server became unresponsive (response-time exceeding 30-seconds) at which point the load-test was stopped. The cloud-server had completely locked up and was unreachable by SSH and remained unresponsive after stopping the load-test; a hard-reboot via the Rackspace control panel was the only means of recovering server function. CodeIgniter scales dramatically better than Symfony 2 and Zend Framework. CodeIgniter managed to serve most of 800-users for 4-minutes, but the 2-second response times and occasional requests that had timed-out (request errors) would not have provided a positive experience to the end-users. After five-and-a-half minutes of this load the requests had became unacceptably-slow (5-6 second response times) and many requests failed with timed-out errors. Despite the paltry 256mb of RAM on these entry-level servers, Vork had sustained 800-requests-per-second for more than half-an-hour, serving 100% of the traffic (zero errors) and maintained response times faster than 1/6th-of-a-second (166ms peak, average response time was an extraordinarily-quick 95-milliseconds.) Vork was the only PHP framework that had never experienced a request-timed-out error and served every single page request with 100% reliability.